Now that you have your Facebook page set up, it’s time to add an opt in form. Don’t worry, if you’re not tech-savvy, this is a very easy process. In fact, you can easily add a form to your Facebook page in just a few minutes. Note: This is for adding a form to a company Facebook page, not your individual/personal profile. You’ll need to create a Facebook Page separate from your personal profile to use this plugin. Fortunately, creating a Facebook page is simple, if you don’t already have one. First, log into your Facebook account. Once logged in, click this link to add the AWeber app.Once there, choose the page you’d like to add the app to, then click Add Page Tab. This will take you back to your home page in Facebook. Now, find your brand page by using the search bar. On your brand page, click the Admin Panel button in the upper right of the page . Choose Update Info from the Edit Page menu in your page’s Admin Panel. Next, click “Apps” on the left. You will be prompted to enter your AWeber login details in order to allow Facebook to connect to your AWeber account. Then hit the Save Changes button to install your form! To change the name of the tab where your form appears, you’ll to go back to the Edit Page area. In this area, click the Apps tab on the left side. Find the AWeber Email Marketing app, and click Edit Settings. In the popup that appears, enter the name you’d like the tab to have in the Custom Tab Name field, and hit Save. And that’s all there is to it. Now any visitor to your Facebook page can become a subscriber to your email campaign. Adding an opt in form to your Facebook page is just the first step. If you really want to take it to the next level though, you’ll want to make it so that your visitor’s information AUTOMATICALLY appears in the sign-up form! You can have your forms appear with visitors’ name and email address already filled out if they’re logged in to Facebook. This will not only make it easier for people to subscribe, since they don’t have to type anything, but also avoids other problems with typing, such as typos, ensuring that you get a valid email address on your list. You can enable this feature when you create your web form, or follow the instructions below to add Facebook registration to an existing form. 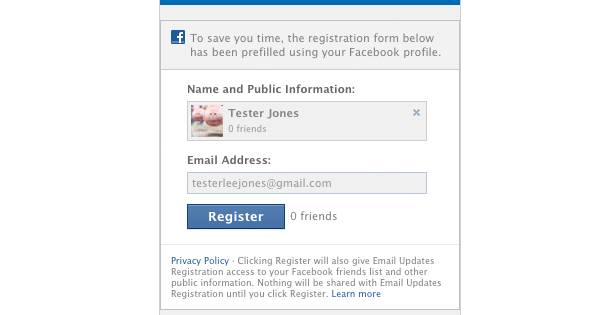 On the Web Forms tab in your account, click the name of the form you’d like to add Facebook registration to. Here, click the Settings tab. On the Settings tab, just check the “Enable Facebook registration form” box. Using the Raw HTML Version? Due to the way Facebook’s registration forms work, any custom fields you use with a Facebook registration forms will become required fields. If your form is less than 300px wide, the form will be resized to 300px in order to accommodate Facebook registration.